There are 14 bones in total in the fingers (phalanges) of one hand. A break (fracture) in one or more of them that is left untreated can lead to permanent stiffness and pain. A severe finger fracture may require open reduction surgery, which repositions any displaced bones, allowing the finger to function properly once it has healed. When a broken bone can be aligned with a cast or splint alone, it is referred to as "closed reduction." Swelling can also affect fingers adjacent to the one that is broken. 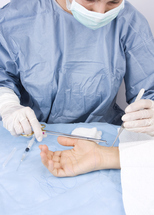 Open reduction surgery is required when a broken finger cannot be repaired by placing it in a cast alone. During open reduction surgery, which is performed under local anesthesia to minimize discomfort, the bones are shifted back to their normal positions, and then held in place with pins, screws or wires. A cast or splint is put in place to ensure that the repositioned (reduced) bones heal correctly; it is left on for approximately 4 to 6 weeks. The pins, screws or wires may be removed once the finger has healed, or may be left in place so that the bones do not shift over time. After healing is complete, physical therapy is usually prescribed to help bring back flexibility to the finger joint.